Ice cream is launching on board SpaceX's Dragon spacecraft on NASA's first contracted resupply flight to the space station. — Ice cream is blasting off for the crew of the International Space Station (ISS). The frozen confectionery — not the freeze-dried souvenir version sold in museum gift shops — is packed on board the first NASA contracted commercial mission to resupply the orbiting laboratory. The Commercial Resupply Services-1 (CRS-1) mission is scheduled to lift off on a Space Exploration Technologies (SpaceX) Falcon 9 rocket on Sunday (Oct. 7) at 8:35 p.m. EDT (0035 GMT Oct. 8) from Launch Complex 40 at the Cape Canaveral Air Force Station in Florida. The ice cream, which is now a not-so-secret surprise for the station's current three member crew, was confirmed as on board SpaceX's Dragon cargo capsule by NASA after a pre-launch press conference held Saturday (Oct. 6) raised the possibility that it was included. "We talked about flying ice cream," said NASA's manager for the space station program, Michael Suffredini. "We try to bring up what we call 'bonus food' for the crew, and this is one of those flights that will have that." The vanilla with swirled chocolate sauce ice cream cups won't melt on their three-day journey to the space station thanks to a freezer on board the Dragon capsule. "We're very excited," SpaceX president Gwynne Shotwell told reporters. "This is the first time we are taking powered cargo up. We are taking up a GLACIER freezer, which has refrigerated science samples in it." 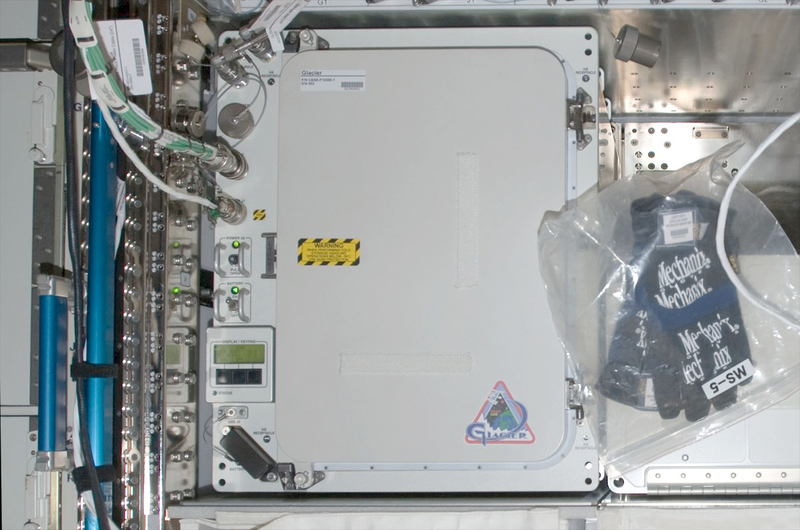 The GLACIER, or General Laboratory Active Cryogenic ISS Experiment Refrigerator, is primarily used to preserve science samples that require temperatures between -301 and 39 degrees Fahrenheit (-160 and +4 degrees Celsius) on the way to or from the space station. The mini-fridge sized freezer previously flew aboard the space shuttle. "Having been on a flight that had an empty freezer on it going up into space, we did fill it [with ice cream] and it's really nice!" Robert Cabana, former shuttle astronaut and the director of NASA's Kennedy Space Center, said. The CRS-1 flight is launching with more than 800 pounds (360 kilograms) of supplies, experiments and equipment to support the space station's crew, and will return to Earth with nearly 1,700 pounds (770 kg) of science results and spent hardware. SpaceX's Dragon capsule is designed to splashdown in the ocean and be recovered. The mission is the first of a dozen supply flights for which NASA is paying SpaceX $1.6 billion to fly. This launch follows a demonstration flight in May that made history as the first commercial spacecraft to berth with the station. 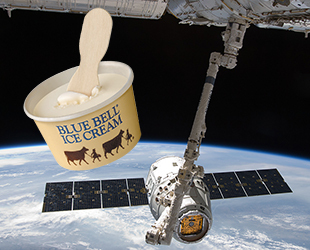 The brand of ice cream flying in the Dragon's GLACIER is Blue Bell Creameries, a Texas dairy that has a strong fan base in Houston, the home of NASA's astronaut corps. 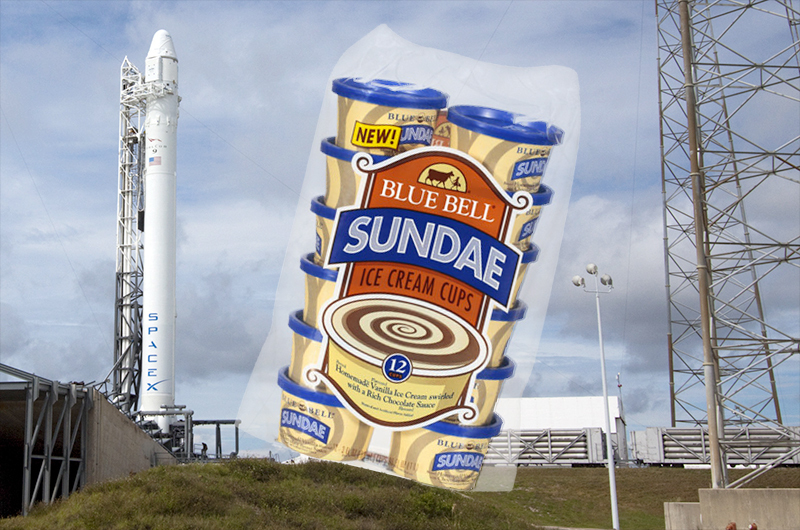 According to NASA, the ice cream flying on SpaceX's Dragon is Blue Bell brand vanilla flavor with a chocolate sauce swirl. All space station crew members, regardless of their home nation, spend time training for their expeditions at Johnson Space Center in Houston. 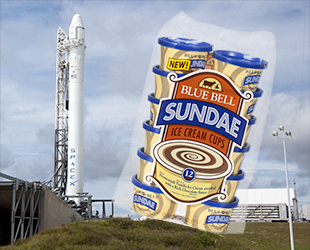 As such, the Blue Bell Sundae Ice Cream Cups should be especially welcome by Expedition 33's commander, NASA astronaut Sunita Williams, as well as flight engineers Yuri Malenchenko of Russia's federal space agency and Japan Aerospace Exploration Agency (JAXA) astronaut Akihiko Hoshide. Williams and Hoshide will control the Canadarm2 robotic arm to capture and attach SpaceX's Dragon capsule to the station's Harmony node. 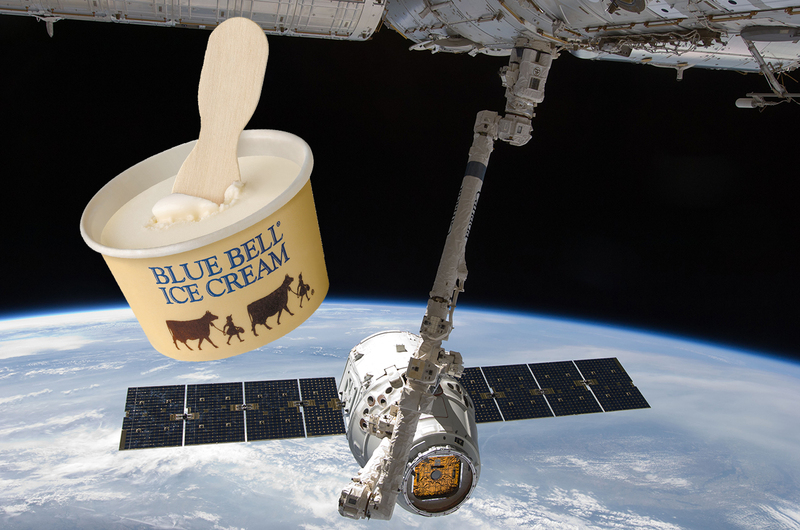 Blue Bell ice cream has been flown to the space station before. 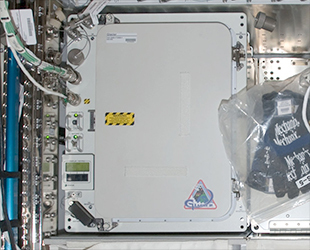 The creamery's cups first launched to the orbiting laboratory in 2006 on board the space shuttle Atlantis.